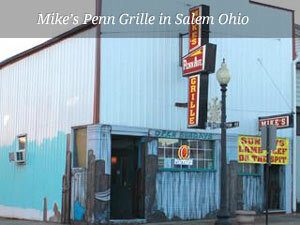 ﻿ Mike's Penn Grille in Salem Ohio ‹ Serving the finest in seafood and steaks! Serving the finest in seafood and steaks! Serving the finest in seafood and steaks, Mike's Penn Grille is located in downtown Salem, Ohio on the corner of State Street and Penn Avenue. Mike's Penn Grill features a full bar with both bar stool and booth seating as well as a separate, beautiful dining area for sit down meals. Waitresses are friendly, take-out is available and there is always plenty of nearby parking. Come on in! Mike's Penn Grill is famous for it's seafood and steak. The burgers are second to none and the daily specials have something for everyone. You can bookmark this website for uploaded menus and specials. Go to our menu page. Mike's Penn Ave Grille might be the best restaurant in Salem, OH. Great menu with many daily specials prepared by real chefs! Steaks, fresh fish, pasta and sandwiches all very good. Seating is limited but, the food is outstanding and well worth a visit. Also has daily lunch specials and very reasonable beer and mixed drink prices all day everyday. Mike's is a must see while visiting Salem! Hours shown above are extended by 1/2 hour everyday during the summer. Copyright © 2012 Mike's Penn Grille in Salem Ohio. All rights reserved. Hosted and Developed bySalem Area Websites SAW.